We celebrate Dunedin’s unique flavour by curating our favourite things from Dunedin’s online stores and profiling the people behind the companies. On Saturday 7 December a group of Dunedin Online businesses banded together to create our first ever Pop-up Shop, held at Toitū Otago Settlers Museum. Representing the hood were: Artemis, Aunty, Azurlis Skin Care, Before the Rain Design, Dear Colleen, Gemma / Gem Maternity, Kiwi As Gifts, Little Minx, Otago Polytechnic School of Design, Salisbury Boutique, Silkbaby / Silkbody, Tamsin Cooper, The Cuckoo's Nest, Tinch, and Tinker. P.S. Big apologies to Dear Colleen and Salisbury Boutique who I didn't manage to film. I blame Mum who I had to take to catch a bus. Speaking of Mum, that's her catchy tune playing over the video (album available here). If you sell stuff online and would like to be a part of Dunedin Online, please fill-out our sign-up form here. Website designer and developer based in Dunedin, New Zealand. Gift boxes tested over years of giving are the secret to Kereen’s success with Kiwi As Gifts. Kereen's love of giving started at a very young age. She remembers helping her mother make wonderful platters of food when they had guests, or for special occasions, such as birthdays and Christmas. She simply enjoys creating boxes of goodies, and her father-in-law is still a willing and happy test-recipient! With a corporate background, having worked in insurance, banking, government department and finance, Kereen’s keen eye for a gift has now come full circle with her business Kiwi As Gifts. Kereen saw a gap in the market for quality gift boxes supporting artisan NZ producers where possible and the opportunity to tailor boxes to specific customer needs. 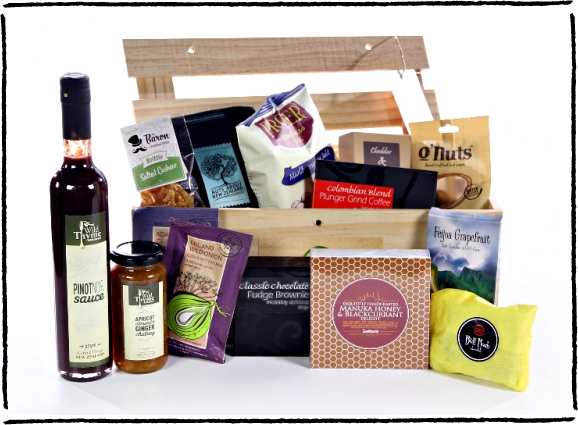 Kiwi As Gifts takes the stress out of finding that perfect gift - whether it be for a birthday, special occasion or just to say 'thank you', Kiwi As Gifts provides a number of Gift Box options to suit most situations and budgets. Options include the “welcome home gift box” ( a clever gift for those house-proud new home-owners, or a 'less than subtle' hint for your newly fledged! ), “baby gift box”, women’s pamper gift box” and the “men’s gourmet gift box”. In a Kiwi As Gifts gift box you can expect to find such goodies as Quick Brown Fox Organic Coffee & Cinnamon Liqueur (hailing from Dunedin), Lucca & Me baby products, Bullrush Chocolate Block or Banks & Co Botanicals. Items are safely nestled amongst eco-friendly wood wool, inside Kiwi As GIfts' signature reusable wooden box delivered direct to the door with your own personal message. Check out Kereen’s varied new range of Christmas gift boxes in her online store and be prepared to impress that client or family member this year! We asked Kereen to tell us what is on her wishlist from our other DunedinOnline traders. She'd like to drop a hint this Christmas for LoveLoops and Azurlis! If you love that particular buzz of finding a cool piece of vintage clothing then you will find a kindred spirit in Tannia Lee of Most Wanted Vintage. For Tannia it’s an obsession. She’s addicted to the excitement of hunting out feature pieces, and the thrill of taking her collection to the next level. Her online store specialises in alternative vintage. She sources stand out pieces to liven up your wardrobe and to inspire you to dress outside the box. So what sort of person makes a living out of the thrill of the hunt? Tannia loves to promote and support sustainable fashion and it makes her happy knowing that everyday she’s working towards a greener earth. After completing a Bachelor of Media Arts and Diploma in Post Production she worked as a video editor in the TV/Video industry for 4 years. Working in small companies meant she had the opportunity to take on roles like director, camera operator, motion graphic artist and production assistant. The skills acquired from this work and her degree enabled her to open and run her own vintage clothing shop in Wellington from 2010-1012. Tannia’s vision is to support the idea of fashion being an independent expression. So, be brave, be confident and free yourself from the expectations of mainstream fashion. Shop online at Most Wanted Vintage! As hard as it must be to pick a single piece, we managed to get Tannia to play favourites. And what would she pick from Dunedin Online’s other stores? This Fantail Dress from The Cuckoo’s Nest. In our new guest edit series we ask stylish Dunedinites and ex-Dunedinites to go shopping and tell us what's in their bag! We're stoked to present our first guest curator.... Wallace Chapman. You may remember Wallace from his time as a DJ on Radio One. Now Wallace Chapman is a radio and TV broadcaster, and public speaker. He hosts a ‘pub politics’ show called Back Benches on Prime, and Sunday Mornings with Wallace Chapman on Radio Live. He also heads up the rambunctious men's panel Monday mornings on Good Morning TVONE. 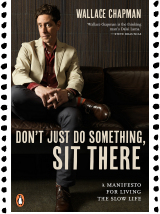 He wrote his first book for Penguin in June called ‘Don’t just do something, sit there’ – a manifesto for the slow living life. We asked Wallace what his favourite things or memories about Dunedin are. "There are many favourite things about Dunedin. And truth be told if my work took me there, part of me would still love to live in Dunedin. Memories? Buying my first pair of Bikkembergs at Plume, Wednesday pint nights at Fuel café, seeing DJ Vadim at Bath Street, sitting in the sun after a crazy night at the Pink Flat, seafood chowder and a wine at Nova. Many great memories." What's in your shopping cart from Dunedin Online, Wallace? I would go shopping at Silkbody for a silk scarf - I love silk. I would get a hollow rock ring for Tabitha from Salisbury boutique. I adore these alice journals from the Cuckoo's Nest Boutique. I would treat myself to some Dunedin hi fidelity from Design Build Listen. And I’d buy a dozen Green Man beers to bring to Auckland! What do skull elbow patches, kitty pincushions and Virgin Mary candles have in common? They’re all part of Claire Warmington’s unusual repertoire, created in a Dunedin garden sewing room for her label, Tinker. Claire came to Dunedin from Wellington when she was 19 years old and has never left. She loves the architecture and slower pace of life in Dunedin. “The fact that the op shopping is good helps too!” says Claire. The Kewpie and Cake snowglobe. Buy it here. A background in the fashion industry has given her the skills to problem-solve when it comes to creating her wares. Combine this with the love of a good challenge and Claire relishes the process of executing her original ideas into a finished product. Lately she has started making snowglobes. “There’s been a lot of trial and error but in a way that’s what I enjoy” she says. We look forward to seeing what Claire comes up with next. Whatever it is, you can guarantee no one else will have dreamed it up before or had the ingenuity to put it into production. Find your next gift at Tinker. On Claire’s wishlist from DunedinOnline is this zip purse from littleminx. Sisters Ella Murdoch and Talia O’Connor have come home to roost in Dunedin after travelling the world and, lucky for us, they’ve brought their favourite parts of the globe with them. Both trained teachers, the sisters have spent the last ten to fifteen years travelling the world and between them have settled in six different countries. 'Emotion Vases' available from MintSix. “Each of the countries we travelled to or lived in had unique histories and more often than not, beautiful objects and wares we admired and took inspiration from. We both knew we would settle in New Zealand one day and discussed opening our own shop, full of the world's treasures!” says Ella. Their online shop MintSix is an exciting shopping experience, offering an eclectic collection of tribal African wall art, quirky, cutting-edge porcelain ceramics, up-cycled, antique and reproduced timber furniture pieces, hand-loomed and hand-painted textiles, gritty, playful, pop-infused artworks, Moroccan leather pouffes and vibrant cushions - all sourced from overseas and home-grown locales. The 'Turkish Kilim Rugs' from MintSix. Ella and Talia grew up in Dunedin and studied here. Once they got their post-university desire to leave their home town out of their system, they returned to bring up their young families, making the most of having their parents around and appreciating Dunedin anew. “It's an easy and safe part of the world to live in.” explains Ella. We asked Ella and Talia for their picks from DunedinOnline’s online shops. Ella loves the art of artist Jon Thom from Moodie Tuesday. Talia is coveting Jolene’s beautiful creations at Estelle Flowers. It's funny how an idea can get away on you, grow legs and become something bigger than you had imagined. DunedinOnline.co.nz started out as an idea to showcase Dunedin fashion retailers in one easy-to-find place. This seemed like a good idea until we realised it didn't have to be restricted to fashion, that Dunedin has a plethora of interesting things available to buy online that punters should know about. At the same time we had been keen for a specific network for e-commerce business owners in the same boat as us. It seemed that many of us were operating in isolation, having little triumphs and failures of our own. Surely, we thought, sharing these ups and downs would be beneficial to (and cathartic for) each other. On floating our idea for a group called Dunedin Online Traders (DOT) we found other business owners to be grateful and enthusiastic. So both DunedinOnline.co.nz and Dunedin Online Traders were born. The first was conceived as the public front for the Traders' group. With DunedinOnline.co.nz we can showcase ourselves in a way that celebrates and promotes both our individuality and the common thread of which we are all proud, Dunedin. With DOT we can support one another, share knowledge and attract benefits for our group's members. So, who are we? I am the co-founder and designer of Silkbody clothing, a 10-year old business that has evolved from small beginnings to a brand with an international reach and four dedicated country-specific ecommerce sites. My husband Sam is an Emmy-nominated designer with his own web design business, (ClarksonDesign.co.nz) and a background in video game and web development. We are here to serve the public good and are excited about where this idea will be taken next. For more information on us, read the about page. To join us fill in the form here. Look out for the DOT section, coming soon (along with many more shop listings). With thanks to the following for their support: Westpac Moray Place Business Banking, Dunedin City Council's Economic Development Unit, Tourism Dunedin, Otago Chamber of Commerce.